The breadth of SkyWest Airlines’ changes at the San Luis Obispo Airport became a lot clearer this week with the airline cutting the number of flights coming into and out of the airport by more than half. SkyWest Airlines is downsizing it daily flights leaving San Luis Obispo from 11 a day to five a day. Beginning on April 7, there will be only two trips a day from San Luis Obispo to San Francisco and three to Los Angeles. A month ago, Avila Beach resident Saro Rizzo booked a flight for his family’s summer vacation from San Luis Obispo to Milan, Italy. The Rizzos were slated to leave SLO at 5:11 p.m. for a 7:05 p.m. connection to Europe. However, the airline has since rerouted the family because of its flight reductions. With the new changes, come less options for travelers. For example, a traveler wanting to leave San Luis Obispo in the morning and connect through Los Angeles for other travel destinations will no longer have a 7:45 a.m. and 8:30 a.m. departure option available as the earliest morning departure for Los Angeles will be at 10:40 a.m. 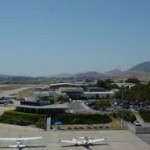 Headed to San Francisco, your only options from the San Luis Obispo Airport will be at 6:20 a.m. or 8:35 p.m.
For the past several years, the airport has struggled with financial challenges at the facility, where revenue has been falling since 2005. Since 2010, airport management has been working to relocate and expand the airport’s existing passenger terminal. In July, the San Luis Obispo County Board of Supervisors voted 5-0 to approve the overall design for a new airport terminal. The new terminal is estimated to cost between $27 million and $29 million. Of that, about $18 million will be garnered through grants, $7 million from the county and $4.7 million from customer facility charges, which are acquired through the rental car operations at the airport. When will we wake up and stop using McChesney Field as our only airborne link to the outside world? Lets build an international airport in Paso Robles and stop subjecting ourselves to being forced to link up in LA or San Francisco on tiny little packed full planes. We’re adults…we can do this. Instead of Paso, why not convert the 3 mile long runway at Vandenberg into an international airport. As part of the project, build a high speed rail line (like from Narita to Tokyo) that goes to San Francisco and LA. This airport can be used to relieve the pressure to the SFO and LAX airports. There already is an International Airport…Santa Maria. If you are concerned about global warming, you should be against any airline traffic at SBP. We all know that jet passenger miles are the most polluting and the pollutants are deposited high in the atmosphere where biology activity can’t remove them. Just out of curiosity, if you think flying to LA causes more global warming than driving, Thumbs Up. If you think driving to LA causes more global warming than flying, Thumbs Down. If you think no matter what we do or what happens certain people will always say global warming is increasing and we need to spend big $$$$$ on it, thumbs…….. Regional Jets or Turboprops (trips less than 500 miles) get around 70 passenger miles per gallon (at 100% occupancy). If the planes are 80% full, that’s still better than vehicle passenger MPG unless you go with 3 or 4 people. So, just on the amount of fuel burned, cars do cause more global warming. The most efficient is by ship but what’s the fun in that? So, the 8 respondents were rather astute. I guess I’ll have to send an official news release to the Trib so that non-CCN readers will get the story. to bed for good. That goes for New Times too!! The Triv is worse than nothing. You are actually reading the Tribune? Amazing!! Almost everone focuses on the bad things about this change and ignores the good things including being able to stand up when walking to your seat, having more overhead storage space, having more comfortable seats, being quieter in the cabin and the plane having fewer breakdowns and delays. Overall, I think its a win for passengers. Now they should work on getting an earlier first flight to LA. So you’re all for a reduction in the number of flights servicing SBP but you want a more convenient flight to LAX? I don’t think you’ll need to worry because once they discontinue the 6 existing flights (which were almost always fully booked), you won’t be able to find an available seat on a flight to LAX anyway. Now combine that with the fact that the current terminal is in violation of FAA rules because it encroaches into the airports runway safety area, not moving the terminal will kill future commercial traffic with the regional jets that are replacing all of the turboprops that we’ve been used to. Try to think of the big picture benefit for the community, not the micro view for just yourself. I’d prefer that there were more flights, mr knowitall, and I’d also prefer a new terminal. However, I think that the new planes are a big improvement, or don’t you agree? BTW, I far prefer flying US Air out of SBP because their planes are so much nicer and more comfortable. There were 330 seats available each day before the change or 120,450 seats per year. The airport’s statistics show that United had only 89,543 departing passengers in 2014. That was only 74.3% of capacity. United also had 87,099 arrivals in 2014, which was 72.3% of capacity. The new planes offer 250 seats per day and 91,250 per year. That’s closer to full capacity based on last year’s statistics. If enough additional people choose to fly United because of the new planes, other flights will surely be scheduled. With only 8 flights out of SBP daily, and a mere 400 daily outgoing passengers, it’s hard to see the need for those extra departure gates they’re planning in the new airport terminal. While the story implies this change is Skywest-driven, it’s actually United-driven, proving that United doesn’t care anymore than American and Delta did about serving smaller markets. When United, American and Delta served SBP, we had more than 20 flights a day. Then airlines started realigning to serve only major markets. It was a marketing decision, not an service-based decision. Is there a market in SLO for more flights? You bet. For the past several years, every time I fly the planes have been totally full out of SLO, and it’s getting harder to get good reservations due to the lack of seats. So why the cutback? Not passenger-driven, for sure. The only good thing about this cutback is it will thwart plans to turn SLO into the next Silicon Valley. Those sorts of companies demand good travel connections. As for driving to SFO and LAX, you folks are behind the times. San Jose is the place to go — closer, easier to get to, less traffic, a much easier airport to navigate. And, it’s served by Southwest, one of the last airlines to provide true value. Good tip on San Jose. And you are right everything the airlines do is profit driven, we only can blame ourselves in the relentless search for the cheapest tickets. I think a lot of people assume that it makes more sense to just drive to LAX or SFO and go from there, but the last several times that I’ve bought tickets (generally on short notice though, that might make a difference) I found that the ticket price was cheaper flying from SLO or SB with a LAX/SFO stop than it was direct from LAX or SFO. Us air is a great hub thru Phoenix and they are merging with American.